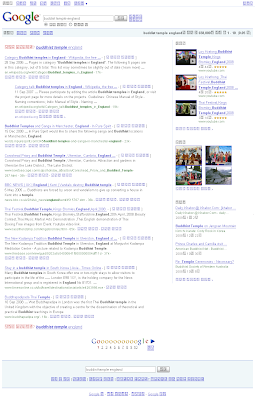 Look at this media rich Google search result page from Korea. You've organic search results on the left - with 'did you mean' suggestions at the top and the bottom. On the top right you've YouTube results. Despite the play arrow you can see in the video thumbnails a click will take you through to YouTube. Then on the right you've images - a little squashed, I think, notice how the left two touch (but this may be due to the lack of any CJK language packs on this laptop and formatting quirks as a result - that also explains all the weird characters you may n). Then you've a social media section - forums and newspapers. Yeah, I know 'temple' is spelt wrong but the correct spelling doesn't trigger the social media section on the bottom right. Question is: where would they fit in the PPC ads?